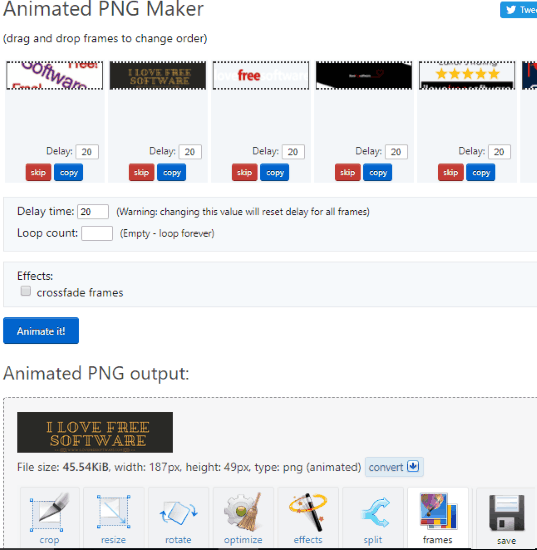 Here are 4 free animated PNG creator (APNG creator) tools. You can use these free tools to make animated PNG files using JPG, PNG, and other supports images. I have covered some free software and online tools to generate animated PNG file. When the animated PNG file is created, you can use any of the available APNG viewers to play the animated PNG file. These free animated PNG makers also come with different and interesting features. You will be able to preview the output APNG, set delay time for input images, background color, loop count for output animated PNG, etc. So, let’s begin with the first free animated PNG creator tool present in this list. JapngEditor is a nice software to create animated PNG images. This software lets use JPG and PNG images to create APNG file. The software has two great features that I like a lot. 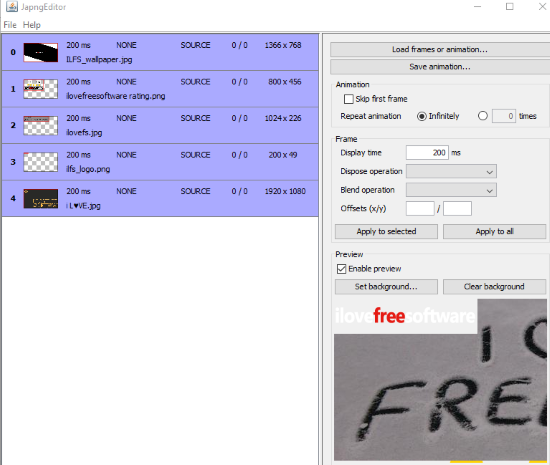 It lets you preview output animated PNG file so that you can get an idea how your output will look. Apart from that, you can set the background color of your choice for the output image. Offsets (x and y positions) for the background can also be set easily. Moreover, you can add the background for all images or only selected images. This animated PNG creator also comes with an option to set delay time for each frame and set animation repetition. Use ‘0’ as value for endless looping. All of these features make it a very good animated PNG creator software. Java must be installed on your PC to run and use this APNG creator software successfully. 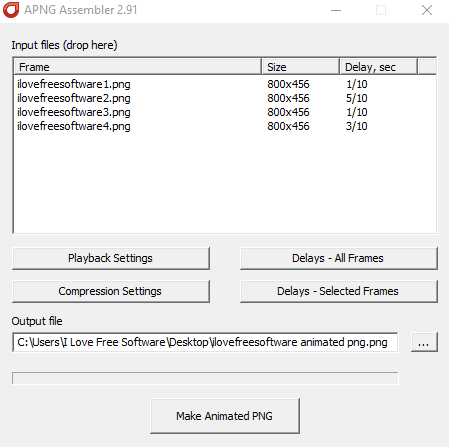 APNG Assembler is a very simple software that can create animated PNG files using PNG and TGA images. It has a very basic interface but all the necessary options to create APNG file are available. You can add images as frames, set the delay for each frame separately (1/10, 2/10, 5/10, etc.) or set the same delay for each frame, and set number of loops for output animated PNG. You can also use any of the available compression methods, such as zlib, 7zip, etc. If an image is added by you accidentally, then you can also remove it before starting the output generation process. So some good options are available to create animated PNG. Once you have done all the settings, you can set output folder and use Make Animated PNG button. After that, you will get the output as APNG file. Note: For generating APNG file, all the input images must have the same size (height n width). Also, the size of the first input image is considered as image size for rest of the images. So if the first image is of 500*400 size, then all images must have the same 500*400 size. Otherwise, it won’t be able to generate the output. This is a limitation of this software, but software is very helpful to create APNG images. Animated PNG Maker (by ezgif.com) is a free online animated PNG creator tool. Using this APNG maker tool is very simple and it has some interesting features also. You can use it to set delay time for each input image separately or set same delay time for all images. Option to set loop count for output APNG is also available. You can also preview the output animated PNG before downloading it to PC. So pretty good options are there for generating APNG file. You can upload JPG, PNG, and WebP images to create animated PNG. You can upload maximum 400 images for creating animated PNG at a time, which is a huge number. Maximum size limit for a single image is 5 MB and total size limit for all the images together is 80 MB. Like APNG Assembler software (mentioned above), it also requires same height and width for all the images. But the good thing is that you don’t have to resize images manually. It provides a Resize button. If images have different size, then you can use that button and all the images are resized in a single click. When the output APNG is generated, you can save it to PC in any folder of your choice. 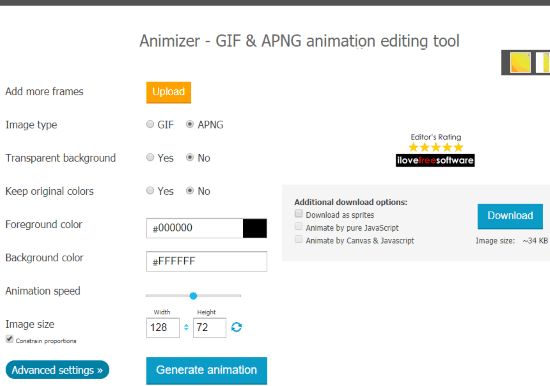 Animizer is also an online animated PNG creator tool. It gives some very good options that make it a good competitor to other APNG makers available in this list. You can add multiple JPG and PNG images to create an APNG file. The maximum number of input images limit is not specified, but I was able to successfully generate APNG file with 7 input images. Before generating APNG file, you can set a custom background and foreground color, use slider to set animation speed for the output file, use transparent background, and set the image size for output file as per your wish. So as you can see, this simple online animated PNG creator has sufficient tools. You can also preview the output before saving it to PC. If you need a very simple tool to generate APNG file, then this online tool is awesome. Animated GIFs are more popular than animated PNG images and there are so many animated GIF makers out there. Still, if you need to create animated PNG files to share with someone, then these simple and interesting animated PNG creator tools will come in handy. My favorite in this list is JapngEditor software. It is so because it provides output preview, set any color as background, and set delay time for individual frames or all frames.